While many would consider Apple responsible for the podcast revolution—the name even comes from the company’s portable audio player—it’s fair to say that the recent Podcasts app on iOS ( ) has met with a fair amount of scorn. Previously, you would listen to podcasts through the Music app, syncing them from iTunes and managing them the same way you managed music. But now, the Podcasts app is a stand-alone tool for managing and listening to podcasts. Here’s a look at how you can work with the iOS Podcasts app, but also how you can work without it, if you’d prefer going back to the old method. Apple released the Podcasts app back in June, and the reaction to it wasn’t particularly positive. Macworld Senior Editor Christopher Breen, in his review of the app, wrote, “Podcasts isn’t a terrible app,” but that “it’s only a modestly capable first step.” Apple has updated the app since then and improved the experience slightly, but there are still quirks, and its interface can be jarring. (At the moment, it gets a resounding two-star overall rating on the iOS App Store.) 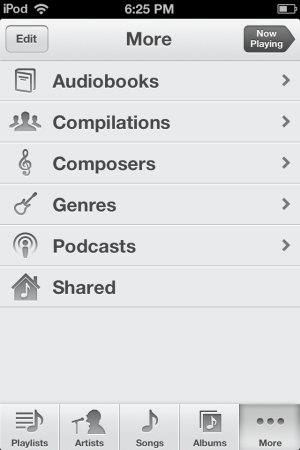 For those used to working with podcasts in the Music app, there is a lot to adapt to. First, if you choose to subscribe to and download podcasts from the Podcasts app, you can do so. The Podcasts app can even sync your podcasts and played status and position with another iOS device (between your iPhone and iPad, for example). 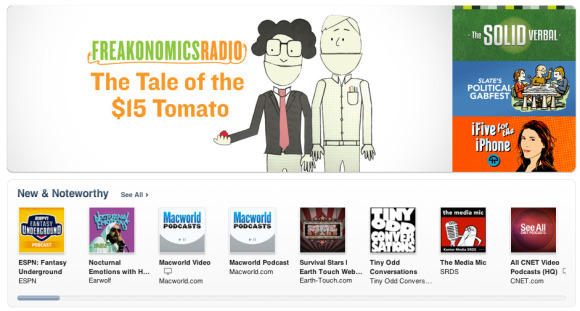 However, it won’t sync with your Mac (or PC), so the Podcasts app is an island unto itself. In addition, it won’t sync with an Apple TV, which, since you sign into it with your Apple ID, should be simple. This may be a step toward splitting up content that is currently stored in the iTunes application on a Mac or PC. Apple has already released Video and iTunes U apps, and it’s possible that, in the next version of iTunes due to be released by the end of this month, this content will no longer be managed by iTunes. Podcasts' settings on the iPad. However, if one of your iOS devices syncs podcasts with iTunes, then, by all means, don’t turn on iCloud syncing, because you’ll find a whole slew of different content on that device. It won’t be there physically—you’ll have to download the episodes if you want them—but you’ll see both those episodes you’ve synced and those that your other device has in its lists of podcasts and episodes (some of which you may have already listened to). The app asks you if you want to sync this information the first time you launch it, but if you ever want to turn it off, select Settings -> Podcasts -> Sync Subscriptions in iOS 6. If you’ve been syncing podcasts via iTunes and want to shift to syncing across iOS devices, I advise deleting the Podcasts app from all the devices you want to use, reinstalling it, and then subscribing to the podcasts you want. If not, you’ll find a melange of podcasts synced via iTunes and via iCloud, which can be a bit confusing. You can choose a number of settings for each podcast. Tap a podcast, then tap the gear icon (on an iPad), or tap the little > to the right of its name (on an iPhone or iPod touch) to access a settings pane. The only information that syncs is the names of podcasts you’ve subscribed to and which episodes you’ve listened to; all the other settings apply to individual devices. If you want to save episodes of a podcast on your iPhone, you need to change the setting on that particular device. This is the same for each iOS device on which you want episodes to autodownload. I’ve explained how you can set up the Podcasts app from within the app, but it’s not the only way you can subscribe to podcasts. 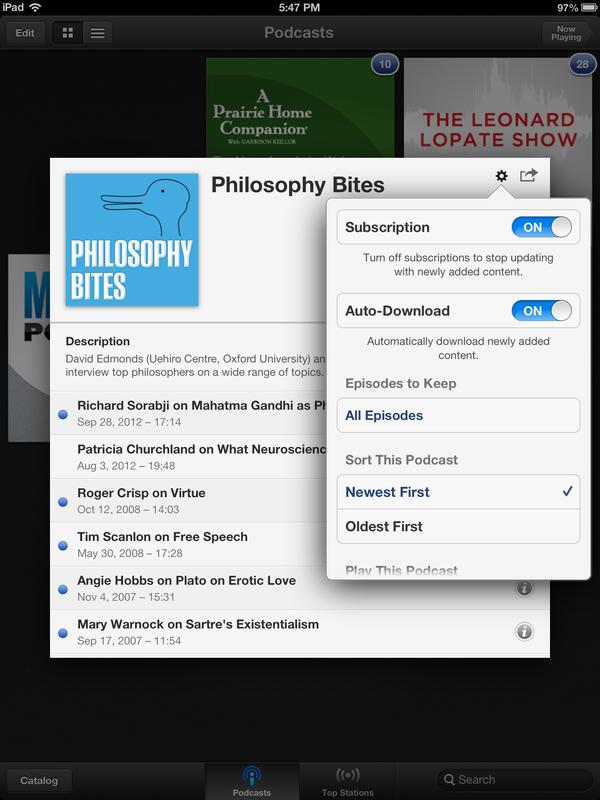 You can continue using iTunes to sync your podcasts, and they’ll show up in the Podcasts app. The advantage here is that the episodes you’ve listened to will sync across devices via iCloud. Also, you’ll update the podcasts on your Mac when you sync with iTunes to get new episodes. If you’re on the road and want new episodes of your favorite podcast, you can go to its settings and turn its subscription on; you’ll see a full list of episodes with download buttons that will let you grab new episodes. Don't like the Podcasts app? Delete it, and your podcasts show up in the Music app, where they were before. Playlists are the biggest issue with the Podcasts app. Many power listeners like setting up playlists of their favorite podcasts, or even creating playlists that alternate podcasts and music. The Podcasts app doesn’t allow you to do so. Even if you sync playlists from iTunes, while the content will get copied to your iOS device and show up in the Podcasts app, you won’t be able to access the playlists. If you go to the Music app, you won’t see an entry for Podcasts anymore, and the podcasts that you so carefully put into playlists won’t be there. And while any playlists you have made will show up, they’ll either be empty, if they only contain podcasts, or they’ll only contain music, if you made playlists containing podcasts and music. If playlists are important to you, there’s an easy solution: Delete the Podcasts app. (Tap and hold the app’s icon until it jiggles, then tap the X in the top-left corner.) Continue downloading podcasts to iTunes, adding them to the playlists you want and syncing to your iPhone or iPad. Tap the Music app, tap Other, and you’ll see Podcasts listed. Tap Playlists, and your podcasts’ playlists will be there as they used to be. You won’t get the syncing of subscriptions and played episodes, but you will have more control over the podcasts you can access. If you care about podcast playlists, it’s clear that the Podcasts app isn’t for you. But if you’re a casual podcast listener and just want the content, then subscribing to podcasts and downloading them from the Podcasts app may suit you. You may not like the interface of the Podcasts app, but it does an OK job with what it’s supposed to do. If you like the idea of a native iOS app but find Podcasts wanting, Seth McFarland’s $2 Downcast ( ) and Joe Graf’s $2 iCaster ( ) are worth a look.